Between July 22nd and August 13th, 2006 family Güntner spent a wonderful vacation in the Andalusian village Mojácar. 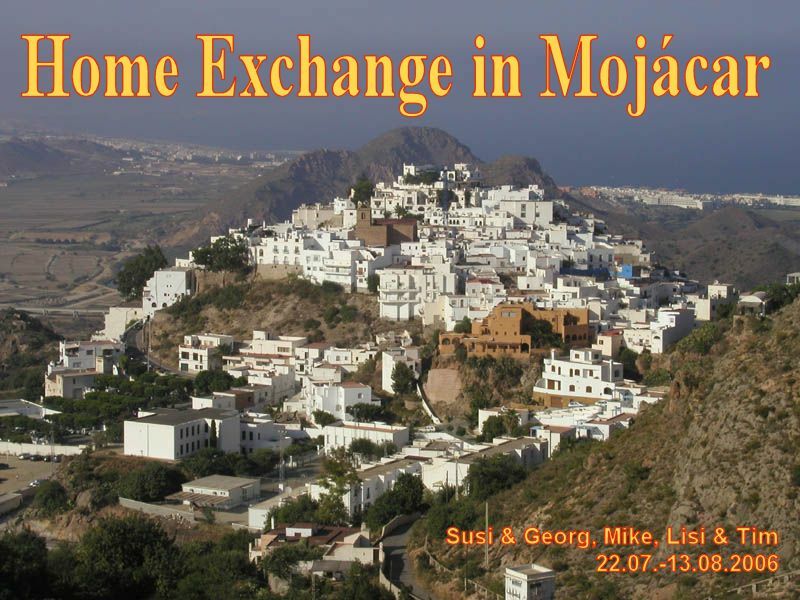 After a break of three years we again went for a vaction on the basis of a home exchange: This time our exchange partner was family Ortega Aranda from Madrid who offered their holiday home in Mojácar for the exchange (for a general information on home exchanges have a look at the Intervac site). With us there were our daughter Lisi with her Swedish friend Tim and our son Mike: They stayed with us for the first two weeks of our three weeks vaction. We returned to Salzburg via Murcia and Palma. A detailed description of the adventures during our vacation in Mojácar is given at Georg's blogworld. Find here an "executive summary" for the understanding of the image gallery: We travelled to Mojácar via Barcelona (spent one night there) and Almeria. Amongst many others the highlights of our stay in Mojácar were the frequent visits of the virgin beaches, a trip to Mini Hollywood (a Western village), a visit to Nijar (ceramics), the trip to Granada including a tour through the Alhambra, the national park Cabo de Gata and a moutainbike tour through the Sierra Cabrera. Have a look and enjoy the image gallery.